​Southampton made it back-to-back Premier League wins as they held on to secure a 2-1 win over Everton. The hosts had the better of the opening 25 minutes, with Danny Ings forcing Jordan Pickford into a pair of smart saves either side of an Ademola Lookman effort that was blocked well by Jan Bednarek. The final 15 minutes of a half dominated by the Saints saw them hit the post twice, first through Nathan Redmond, whose shot glanced the outside of the post, while an Andre Gomes clearance to thwart Ings smacked off the woodwork as the game somehow entered half time goalless. Despite a bright start to the second half by the visitors, with Gylfi Sigurdsson's header forcing Alex McCarthy into a decent stop, Southampton took the lead in the 50th minute with a stunning 20-yard drive from James Ward-Prowse that gave Pickford no chance. The Saints then soon doubled their lead 14 minutes later in fortuitous circumstances, with Lucas Digne poking the ball into his own net from outside the area as he looked to dispossess Redmond; who was through on goal. Southampton were made to sweat late on when Sigurdsson slotted home in the 90th minute to half the deficit, but the Saints held on for their second home league win of the season. Southampton have been revitalised since the arrival of Ralph Hassenhuttl in December, with this win against Everton arguably the greatest indicator of the work the Austrian has done during his brief time on the south coast. His side were by far the better team throughout the game, their pace and energy causing Marco Silva's side all sorts of problems, while the defence did well to hold on in the final minutes with the pressure that came following Sigurdsson's late consolation. 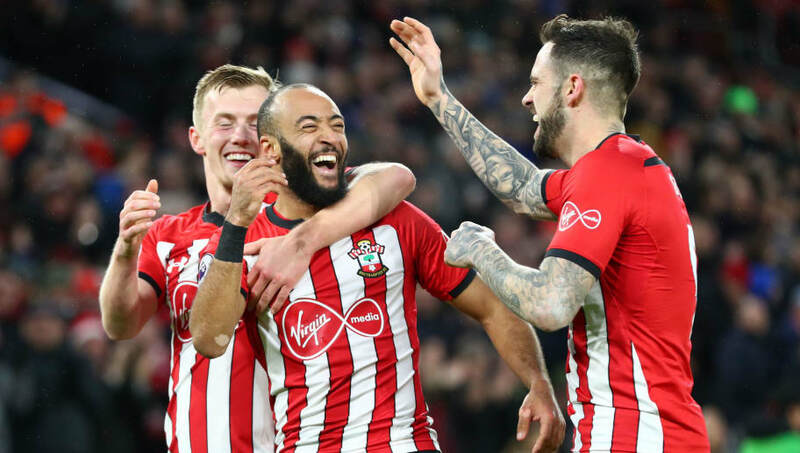 With impressive displays from the likes of Nathan Redmond and James Ward-Prowse, Hassenhuttl looks to have turned the fortunes of the Saints around, which bodes well for the remainder of the season. Starting XI: McCarthy (5); Bednarek (7), Stephens (6), Vestergaard (5); Valery Valery (6), Hojbjerg (6), Romeu (6), Ward-Prowse (7), Targett (5); Redmond (8*), Ings (7). Substitutes: Soares (5), Long (6), Armstrong (N/A). Nathan Redmond was the best player on the pitch, never giving the Everton defence a minute's rest operating as a central forward. The former Norwich man was a constant threat in behind with his pace, while he also provided some dangerous crosses when he drifted into wide areas, and had a hand in a the Saints' fortuitous second. By no means a poor display from Jannick Vestergaard, the summer signing played a few slack passes early into the game, while his lack of pace was exploited whilst playing on the left of a back three. Everton came into the game at St Mary's off the back off two wins from their last nine in the Premier League, and Marco Silva's side looked like a group bereft of confidence. Out-run, out-fought and out-played by the Saints, Everton were deservedly beaten at St Mary's and, despite having more of the ball over the course of the game, produced very little to trouble Alex McCarthy until Sigurdsson's late goal set up a tense finale. It's still early into Silva's tenure at the club, but he'll be hoping to see an upturn in fortunes, and quickly, especially considering the amount invested in the club over the summer in terms of signings. Starting XI: Pickford (6); Coleman (5), Keane (5), Zouma (7), Digne (5); Gomes (5), Gueye (6); Lookman (5), Sigurdsson (6), Bernard (5); Richarlison (4). Substitutes: Calvert-Lewin (5), Tosun (5), Walcott (5). Kurt Zouma was impressive at the back for Everton, producing a number of key blocks and defensive effort in the first-half to keep the visitors in the game, while the on-loan Chelsea defender couldn't be faulted for either Southampton goal. It's unclear what Richarlison's favourite position is, but the Brazil international cut a frustrated figure up front for Everton, barely getting a kick and failing to impact the game whatsoever before getting subbed in the 65th minute. Richarlison shouldn't be exempt from criticism. Been extremely poor recently. With Southampton out the FA Cup, their next game comes a week on Wednesday when they host Crystal Palace. Following their FA Cup fourth round tie against Millwall next weekend, Everton return to Premier League matter in the days that follow when they travel to Yorkshire to face Huddersfield.